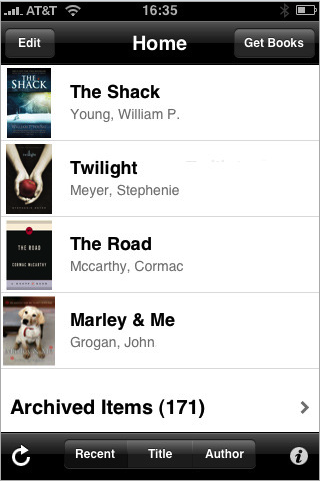 The big news today is that Amazon has released a free app for reading the 240,00 ebooks sold in its Kindle ebook store. Kindle for iPhone already had hundreds of reviews by mid-day, with most of them giving four or five stars. One of the nicest features is that when you buy a book, it remembers where you left off reading. 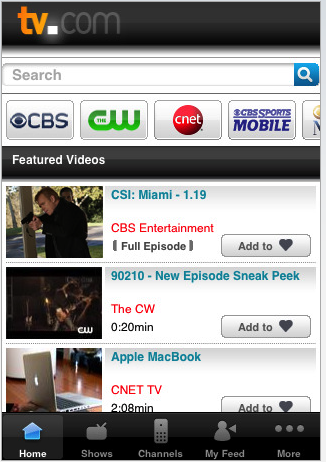 CBS Interactive is a free app that AppleInsider says is the first iPhone app in the U.S. to provide free streaming TV content directly from a studio. The IPhone Blog has a how-to telling the steps you need to go through if your iPhone becomes completely non-responsive. It entails powering off your iPhone and then pressing and holding the home button while you connect via USB. They also have a post telling how to force quite applications. Help me make my iPod my preferred music player! Last week I posted all the reasons why I'm still using my Windows Mobile smartphone as an MP3 player instead of my 8GB iPod Touch. It turns out that I was mistaken about who owns my device, and in fact there's nothing stopping me from buying accessories or software to make it the best it can be. So now the question is, what should I buy? Read more about Help me make my iPod my preferred music player! We're iPhone lovers here on this blog, and the iPhone is undeniably popular worldwide. But not in Japan. There the phone companies have to give the iPhone away, and even then people avoid it. Wired is reporting that the distaste comes from a calling plan that's much more expensive, and also missing functionality that's important to the Japanese, who are big on taking videos and fairly high quality photos on their phones. Puzzlicious from GiantCrayon Games is a new puzzle game for the iPhone and iPod Touch available for $0.99 from the Apple iTunes Apps Store. 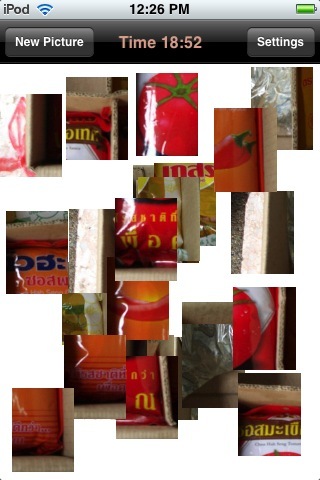 The game is a straightforward rectangular piece re-assembly objective to reconstitute a random photo pulled from your iPhone's photo library or from the developer's Picasa web album account. Digg, as you likely know, is the most popular of the social media sites -- that is, sites where users identify the most interesting and newsworthy tidbits, and then vote on which they like best. I check "Top in 24 hours" area of Digg many times a day to see what interesting, funny, pointed, or poignant news items, images, and videos are connecting with the popular mind. With Microsoft's recent announcement of POP access to its popular Hotmail email service, iPhone users can finally begin getting their email with the built in client software. Setting up your Hotmail account is simple on the iPhone since it retrieves all of the correct settings automatically so your email will be up and running in mere minutes. 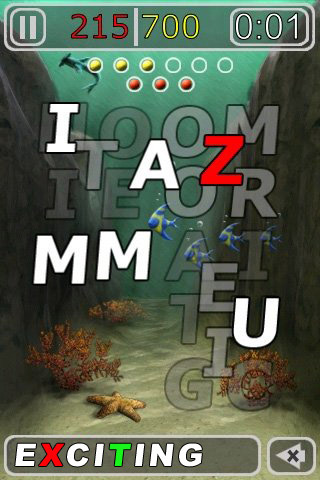 "LetterBug is a frantically fun, and challenging word-spell puzzle game, new from Portable Zoo. In Letter Bug, players spell words from layers of letters. The bigger the words and the faster you spell them, the more points you get. As you “clear” letter layers, more letters come up onto the primary layer to use. Yesterday FranklinCovey Products released the first in a series of iPhone apps that incorporate its planning and productivity methodology allowing users to collaborate with an entire smartphone network and web-based browsers in real-time. 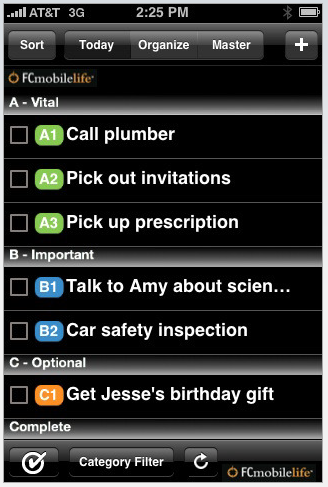 The first of the FCMobileLife series is FCMobileife Tasks, which is a feature-rich task management tool. Yesterday I wrote about a FAIL where movies for many iphone users are not playing. I do not have a the full answer as to why it’s not working, although it seems that the .flv (flash version) of the video is playing instead of the h.264 (apple version). As of this writing, it still does not work for me; even after a few reboots. However, I did find a way to get video to work. This is another what-will-they-think-of-next app. I continue to be astonished by the range of iPhone apps. Safety Button offers a big red button that will make you or your children safer when out and about. When you start the program, your iPhone starts tracing your steps on a server. I'm going on a long train trip from Kansas to DC next week to attend DrupalCon, and I've got a big audio book to listen to, but after some thought I'm planning to use my Windows Mobile smartphone instead of my iPod Touch to listen to it. I thought I'd post my reasons here to see if some of you iPhone fans can help me change my mind! 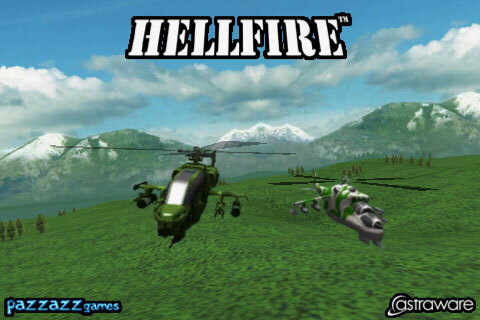 This was my favorite WinMo helicopter combat game, and now Astraware and Pazzazz Games have developed a version for iPhone finally!